For those who smoke 20 cigarettes or less a day. Helps overcome your urge to smoke.NiQuitin Minis are part of a programme designed to support your wish to stop smoking. Using Minis at regular intervals gives your body the nicotine you need to help you stop smoking. Stopping smoking straightaway is best for your health. However if you are not able to, you can also use NiQuitin Minis to help you cut down on smoking, perhaps before stopping, or to help you stop smoking for short periods of time. How to Use For oral use. NiQuitin Minis relieves and/or prevents cravings and withdrawal symptoms. Put one NiQuitin Minis in your mouth and allow to dissolve fully. This should take around 10 minutes. Use a maximum of 15 lozenges a day. 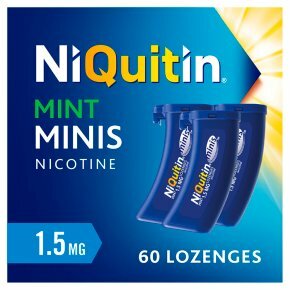 Stopping smoking straightaway (adults and children 12 years and over): Have a NiQuitin Minis when you have an urge to smoke. Use 8 to 12 a day for up to 6 weeks, then gradually phase out their use. Stop using NiQuitin Minis when you are using 1 or 2 a day. Cutting down, perhaps before quitting completely (adults 18 years and over): Have a NiQuitin Minis instead of a cigarette when you feel a strong urge to smoke. Cut down your cigarettes by as many as possible. Quit as soon as you feel able, then follow the instructions for stopping smoking straightaway above. Stopping smoking for short periods of time (adults 18 years and over): Have a NiQuitin Minis instead of a cigarette when you feel a strong urge to smoke. Use a NiQuitin Minis every 1-2 hours. You are more likely to quit smoking when using this product with help from a healthcare professional or support programme. For full instructions please read the enclosed leaflet carefully.